An orifice plate is essentially a disc with a central aperture which is inserted into a pipeline between a pair of flanges. Orifice plates are mainly used to achieve restricted or controlled flow of a process fluid. What happens when fluid flows through an orifice plate? In simple terms, when the fluid flowing in a pipeline passes through an orifice plate, the fluid velocity increases through the reduced orifice area and develops a differential pressure across the orifice device. The differential pressure created is related to the beta ratio (β) of the orifice plate where the beta ratio is the ratio of orifice bore diameter / inside pipe diameter (d/D). In general, an orifice plate will typically exhibit a bore diameter between around 30 to 75% of the pipe inside diameter. A beta ratio of 0.6 therefore exhibits that the orifice bore diameter is 60% of the pipe inside diameter. Therefore, the smaller the beta ratio, the higher the differential pressure generated. In working practice, the selected beta ratio is a generally compromise between the flow rate required and the desired differential pressure. FluidFlow software enunciates a message to the designer if the calculated beta ratio is outside of the recommended range as described in ISO 5167. The typical pressure profile across an orifice plate is shown in Figure 1. Figure 1: Typical pressure profile across an orifice plate. In Figure 1 we can see that the static pressure upstream of the orifice plate increases slightly due to the effect of back pressure and the decreases sharply as the flow passes through the orifice plate. The pressure actually continues to drop until it reaches what’s known as the vena contracta where the velocity of flow is at its highest. Beyond the vena contracta, the static pressure starts to recover however, it never reaches the upstream value. There is therefore always a permanent pressure loss across an orifice plate. We have seen that when an orifice plate is fitted in a pipe which is transporting a fluid, the fluid velocity will increase and at the same time the pressure will decrease. It is relatively simple to measure this decrease in pressure which can be used to determine the velocity and consequently, flow rate. Energy losses across an orifice plate can be significant and it is therefore necessary to introduce a discharge coefficient (Cd) which is equal to the ratio of actual flow rate to the flow rate with no energy losses or theoretical flow rate. The discharge coefficient also considers the small difference between the cross-sectional area of the vena contracta and that of the orifice plate. An orifice plate has the advantage of being inexpensive and simple to use but high-pressure losses are sustained. We can see from Figure 1 that the measured differential pressure developed across the orifice plate is depends on the positioning of the sensing points or pressure taps. Let’s look at a selection of common tap positions. Corner taps are positioned immediately adjacent to the upstream and downstream plate faces. They are often used in installations with pipe diameters of 2 inches or lower. Corner taps are commonly used throughout Europe. Flange taps are positioned 25mm from the upstream face of the orifice plate and 25.4mm from the downstream face. They are often used for pipe sizes of 2 inches or greater. Flange taps are commonly used in the U.S. 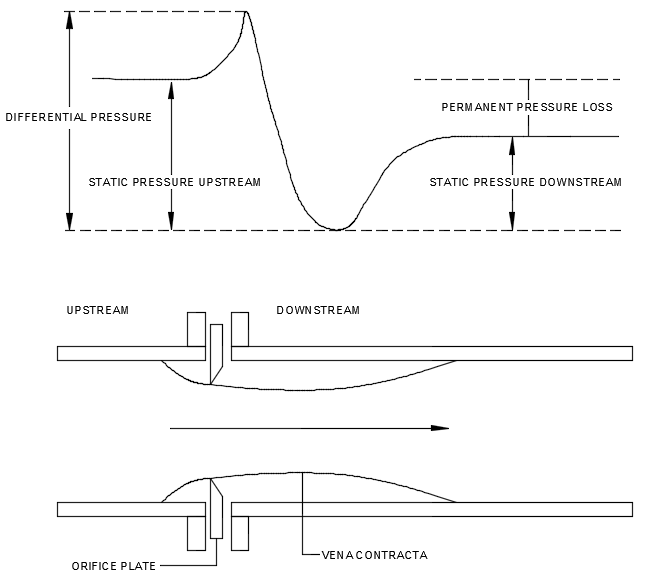 These taps are positioned 1D upstream and at the point of minimum pressure downstream (the vena contracta). This point varies with the beta ratio and is generally only used in plant measurement where flows are relatively constant and plates are not changed. The vena contracta taps provide the maximum pressure differential, but also the most noise. D and D/2 Pressure Tappings. The position of the upstream pressure tapping is nominally equal to D and the position of the downstream pressure tapping is nominally equal to D/2 where, D is the inside diameter of the pipe. These taps are positioned 2.5D upstream and 8D downstream of the orifice (position of maximum pressure recovery). The example case shown in Figure 2 is based on an orifice plate installed in a pipeline transporting water. The calculation has been completed based on the ISO 5167 Standard. A simple model was created in FluidFlow software using the ISO 5167 relationships. The software results were then compared with those of the hand calculation. We can expect very subtle differences between the software result and hand calculation owing to the level of comparable accuracy and the slight difference in fluid physical properties, i.e. the software being much more accurate in both cases. The design pipe diameter was 300mm with an orifice size of 120mm. The benchmark hand calculation was based on a fluid density of 1000 kg/m3 and viscosity of 1.2927 centipoise. The hand calculation also quotes a velocity of 2.46 m/s, a flow rate of 0.0279 m3/s and a flange tap loss of 8200 Pa. Figure 2: Modelling of an orifice plate to ISO 5167 Standard – FluidFlow. Based on the available system data, FluidFlow software calculated a flange tap loss of 8170.1 Pa with an associated flow rate of 0.0279 m3/s and a velocity of 2.47 m/s. It can therefore be seen that the results compare very well. The subtle differences in results can be attributed to the differences in fluid density 999.06 kg/m3, viscosity (1.138 centipoise) etc. Orifice plate apertures can be configured to handle various flow measurement applications. The design of the orifice plate, its position and the position of the tappings are described and specified by BS and ISO standards to minimise pressure losses and to give reproducible results. Let’s consider a few typical orifice plate configurations. This is generally the most commonly used type of orifice plate with the orifice bore positioned along the pipe centreline. When designing and configuring orifice plates, there are several factors which must be followed to ensure accurate and reliable measurement. The orifice upstream edge should be sharp and square. The minimum plate thickness is standardized based on orifice bore, inside pipe diameter etc. The beta ratio (d/D) should be within recommended limits to ensure conformance with recommended practices. The plate surface flatness should also be within the acceptable tolerance limits. The eccentric orifice plate is similar to the concentric device in that it also exhibits a circular opening/bore. The bore position however is offset from the centreline of the pipe. When the bore is offset and oriented downwards of the pipe centreline, this enables flow of impurities in the measured fluid through the orifice without forming deposits and sediments in front of the aperture. Eccentric orifice plates are often used in pipelines transporting heterogeneous mixtures, fluids carrying small amounts of non-abrasive solids or gases with small amounts of liquid or where there is the potential for formation of sediment, tar deposits etc. This device is essentially a thin plate with an opening in the shape of a circle segment which is comparable to a partially opened gate valve. This device is generally used for measuring liquids and gases carrying non-abrasive impurities including light slurries or exceptionally dirty gases. The predictable accuracy of both segmental and eccentric orifice plates is not as high or reliable as the concentric orifice plate device. Automatic Sizing of Orifice Plates. FluidFlow software gives you the ability to model specific orifice plate sizes however, the software also includes powerful equipment sizing technology which allows you to size pipes, pumps, fans, control valves, relief valves and of course, orifice plates. Previous blog-posts discuss sizing of control valves and relief valves in further detail. You can view these on the “Blog” page of our website. Let’s get back on track and consider auto-sizing of orifice plates in a simple cooling circuit with several plate heat exchangers. It is intended to balance the flow to each of the five heat exchangers using orifice plates. The total system flow rate is 11.96 kg/s and for the purposes of this exercise, the design temperature change across each heat exchanger is 5oC. The model was created and solved without any flow balancing. The result of this solution is shown in Figure 3. We can clearly see the mass flow through each heat exchanger is quite different and unbalanced. As such, the calculated temperature change across each heat exchanger varies depending on the flow rate. Figure 3: Unbalanced Cooling Circuit Model – FluidFlow. FluidFlow software allows us to auto-size orifice plates based on either a design flow rate or design pressure drop. We can use the equation Q = m.C.∆T to determine the design mass flow rate (m) through each heat exchanger. The mass flow is therefore: m = Q / C.∆T = 50 / 4.18.5 = 2.392 kg/s. Using the software auto-sizing option, we can define the design flow rate of 2.392 kg/s across each orifice plate and allow the software to determine the required size of each orifice plate in the system. Figure 4 shows each orifice plate has been auto-sized and the calculated size required shown in each case. For instance, we would need an orifice plate with a size of approximately 13.76mm in the line serving HE1. Figure 4: Balanced Cooling Circuit. Orifice plates automatically sized based on design flow rate – FluidFlow. We can now update the model and instead of auto-sizing the orifice plates, enter the actual diameter in each case and solve the system on that basis. Figure 5 shows the results of this case. Figure 5: Balanced Cooling Circuit. Orifice plate sizes defined based on results calculated in Figure 4 – FluidFlow. Figure 5 also shows the calculated corner, flange and D and D/2 tap losses for each orifice plate. Orifice plates can be found in most process plants owing to their simplicity and comparatively low cost. It is worth noting that, a number of factors can affect the accuracy of the device by as much as 15 % or even higher. These factors include improper installation, blockage or partial blockage, misplacement of the instrument, installation of slightly warped orifice plate, deposit build-up on plate surface, deposit build-up on pipe on either side of plate, different or unexpected flow conditions, i.e. single phase vs two phase flow. Damaged plates can also result in a lower level of accuracy. This blog gives a broad overview on orifice plates as well as sizing of orifice plates for a “canned” closed loop cooling circuit example. If you are interested in reading about closed loops systems, sizing of control valve or relief valves, take a look at some of our other blog-posts. Introduction to Food Process Engineering by P. G. Smith, Peter Geoffrey Smith. Fundamentals of Orifice Meter Measurement, Emerson.